dark beige: WHO'D HAVE THOUGHT A MAN WHO DRESSED AS THE FAT CONTROLLER FOR MONEY WOULD BE A PAEDO? 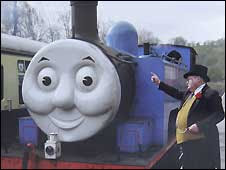 WHO'D HAVE THOUGHT A MAN WHO DRESSED AS THE FAT CONTROLLER FOR MONEY WOULD BE A PAEDO? I'm reading: WHO'D HAVE THOUGHT A MAN WHO DRESSED AS THE FAT CONTROLLER FOR MONEY WOULD BE A PAEDO?TWEET THIS!